Edie Lehman, longtime Arabian horse trainer, judge, mentor and all around great gal passed away August 26, 2009 from a battle with cancer. Known to all as a true horsewoman, Edie "was a rare and precious commodity: a horse trainer who put the welfare of the horse first. She left us too soon." The memorial service for Edie Lehman will be a celebration of her life, starting at 2pm Sunday October 18th in the covered arena at Loomis Basin Equestrian Center in Loomis, California. Emergency crews flew a 1,100-pound horse out of the canyon near Cool Thursday after the horse and its owner were trapped overnight. Owner Alicia Hutcheson's voice quavered as she described the terrifying ordeal she and her 8-year-old paint-thoroughbred-cross horse Natasha endured when they were caught in the American River's strong current. On Thursday, Hutcheson and Natasha were on firm ground surrounded by the crews that rescued them. Hutcheson said Wednesday afternoon she and a friend decided to go for a ride in the canyon. She was sitting atop Natasha, who was about knee deep in the river to cool her legs, when the ground below gave away. Hutcheson said Natasha was spooked and lunged forward, taking them both into the current as Natasha thrashed in the water until she was trapped in branches. It was at that point Hutcheson said she was certain death was imminent. "She started flopping sideways," Hutcheson recalled. "Then I saw the sparkle go out of her eyes." There are many ways to take in the towering majesty of Patagonia and the lunar landscapes of the Atacama Desert. Led by first-rate guides and native gauchos who know the territory as well as their mounts, explora's Equine Experiences are an exquisite combination of natural beauty and adventure as only the back of a fine horse can provide. 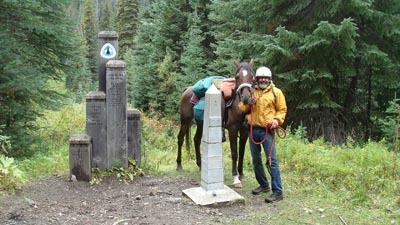 If you've never had the pleasure of a wilderness adventure on horseback, you don't know what you are missing. Few modes of touring offer the same intimacy with the landscape or potential for excitement. From the warm, breathing mass beneath your saddle to the brush of trailside foliage on your skin to breathtaking canters up sand dunes, riding is a full-on experience – whatever your pace. Sure you'll be sore. But for a sensual take on the natural beauty of Chile, nothing beats a horse. explora Equestrian Experiences are geared for riders novice through advanced. 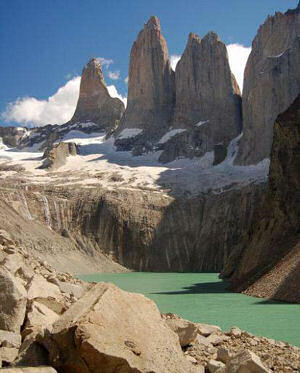 Guests delve deep into the Atacama Desert or Torres del Paine National Park in Patagonia on English and Chilean saddles. The latter, designed for comfort by explora founder, Pedro Ibanez, is affectionately known as "the couch." Unlike many equine operations throughout Chile and around the world, explora maintains its own horses at Hotel de Larache in Atacama and Hotel Salto Chico in Patagonia. Guests can look forward to well-bred, well-trained horses tended by caring hands and stabled on site or nearby. Indeed, the professionalism is part of the draw. Gaela Hourcq, a French-born equestrian with 15 years of international experience at guiding, breeding, training and stabling – including winning the first-ever Torres del Paine National Park endurance competition in 2005 – oversees stable operations at both properties. In Patagonia, she is joined by gauchos who not only live the South American cowboy lifestyle but also portray it to their guests. When Lindsay Bean was a child, she owned her own pony and rode draft horses on her family's dairy farm. But when she tried her hand at endurance trailriding at age 14, her casual love for equines turned into a drive for excellence. Lindsay, a 2008 Telstar High School grad who is now studying biology at the University of Southern Maine, lived in Dixfield during her childhood. She sometimes came to Bethel to visit her aunt and uncle, Tim and Joanne Korhonen. The Korhonens live just up the road from Tom Hutchins and Kathy Brunjes, who are both accomplished equestrians. They offered Lindsay a chance to try out trailriding around their horse farm. And after a couple of months, they took her on a competitive ride. Come ride with us at the Right Lead Endurance Ride on September 26, 2009. The trails are moderately difficult with some rock and hill, and ample water. There are great camping sites with a bathhouse, dump station and electrical hookups. Trails are shady and beautiful for a fall ride. This sport is open to any breed of well-conditioned trail horse and athletic riders. In 1977 the Natchez Trace State Park held its first endurance ride. This ride started with 54 mile and 25 mile rides. The Natchez Trace ride was considered one the best rides in the country, drawing riders from as far as South Dakota, Australia, and Illinois. Al Stokes, Joan Hunt, Marie Threadgill, Pat Pugh, Ronnie McCollugh and Rudy Watkins were mentors of these rides, which continued until 1998. Back then this was considered a male dominated sport, but women are increasingly taking the lead on these rides. Dane Frazier rode this ride on an 1100 lb Quarter Horse with a 65 lb roping saddle with saddlebags on the back. For more information, contact Karen Dely at 731-614-0902. Ride entry forms and more information available at www.aerc.org. Proceeds donated to the Equine Rescue and Protection Humane Society Inc. I had a hard time deciding how many days to ride Chief. I really wanted to ride him all five days but then in the end decided that I really should ride Bo a day. I was glad that I did, because after I finished Bo was a little sore on a splint that he has on a front leg. When the vet palpated it, he made it noticeably sore. Fortunately it didn’t bother Bo by the next day but I still decided that I better not take him on the Virginia City ride. Over 200 horses have been evacuated from fire threatened areas of Los Angeles County, USA, as the so-called Station fire continues to threaten properties in the tinder dry hills. Mary Lukens, Emergency Coordinating Officer for the LA County Department of Animal Care and Control, said: "I've got 115 volunteers and 3 rescue sites for the horses, spread over a 60 mile area. "We have a very active horse community here with all types of horses from leisure, hunter jumpers, endurance to cattle horses. I run the equine response team. All our volunteers, evacuating the horses, are horse people." The Station fire, so-called by the fire service because it started near a ranger station in La Canada Flintridge, has burned over 144,000 acres and is the largest conflagration in Los Angeles County history. Winning a 50-mile endurance ride depends a lot on knowing when to go slow. The first horse and rider across the finish line is the victor, but only if the horse stays healthy. The 17 horseback riders in Sunday's sixth annual Caja del Rio endurance event west of Santa Fe knew coming into the veterinary checkpoint too fast would raise their mount's heart rate and cost them valuable time. Marcelle Abbott and Philip Langenscheidt of Alamogordo finished the first 21-mile loop in two hours, but walked their gray Arabian horses toward the end and dismounted 100 yards from the check-in at base camp. Their horses quickly met the "60 in 60" required pulse rate (60 beats in a minute). They were given a time 45 minutes later to start the next loop of the 50-miler. Horses that don't meet the test have to wait until they do, delaying the start time for their next leg of the race. "That penalizes a rider who comes in too hard," said Larry Nolen, a Pojoaque-based equine veterinarian who checked the horses as they came through. Abbott and her 13-year-old gelding, Natta Lotta Gold — aka "Junior" — finished two 55-milers back to back in mid-August at the six-day Fort Stanton Pioneer endurance race. This was her first time at the Caja del Rio event. "I ride conservatively," she said, after Nolen had checked Junior over for any signs of lameness, dehydration, and digestive or heart problems. Ina Robinson's roots run deep in the Auburn area. You could best describe her as "Old Auburn," if there is such a description. Robinson is a Robie — her grandfather was E.T. Robie, Placer County pioneer and founder of Auburn Lumber who, with a partner, formed the Placer County Bank. E.T. Robie came out west to work for his uncles, the Towle brothers. "The Towle brothers came out from Vermont and set up a lumbering business supplying timber for the western section of the Transcontinental Railroad and my grandfather came out to work for them," Robinson said. E.T. Robie was Wendell Robie’s father and Robinson is Wendell's niece. Wendell Robie is the founder of the Tevis Cup 100 Mile Endurance Race. It's fire season in California, where a shortage of rainfall has resulted in dry conditions. As of Monday evening, there were 13 fires burning throughout the state. In Southern California, the Station Fire in the Angeles National Forest near Flintridge had already burned more than 100,000 acres and was only 5% contained as of Monday evening. It destroyed 53 structures and threatened thousands of others. Mandatory evacuations are in effect in several areas, with large animals being directed to Antelope Valley Fairgrounds. Pierce College is also accepting horses, donkeys, and mules. In San Bernardino County, just over 1,000 acres have succumbed to the Oak Glen Fire. Although thousands of structures have been threatened, only one home has been damaged. Those under mandatory evacuation orders are directed to take horses to the Yucaipa Equestrian Center. In Northern California, the 49er Fire in Auburn has burned 275 acres, much of which is residential. Fifty residences and 10 commercial buildings have been destroyed, and the fire was 70% contained as of Monday evening. Although mandatory evacuation orders were previously in place, they have now been lifted. “Rush Creek Arabians has raised horses for the sport of endurance racing for over 50 years and have held the Reunion races for the past three. Lyle said, “All the races are AERC (American Endurance Ride Conference) sanctioned. Riders may sign up from now until the morning of the race.